Bell Pepper fruits are grown in a rainbow of fascinating colors: green, white, yellow, red, orange, and chocolate brown. 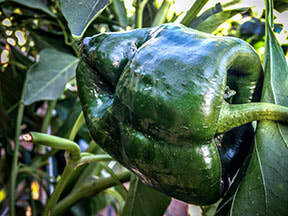 Green fruits are actually immature Peppers. If you leave them on the plant, they eventually will develop one of the other colors, most commonly red, and become sweeter. Bell Peppers are being hailed as a superfood, low in calories, high in flavor, and Vitamins A, C, and other nutrients. Bell Peppers need temperatures above 16°C to grow well. It's best to protect plants from cold temperatures. California Wonder has been the standard Bell Pepper for many decades, this 1928 introduction is still the largest open-pollinated, heirloom bell you can grow. A perfect stuffing P epper: thick-walled, tender and flavorful. Nikita Peppers have large, blocky, crisp, thick-walled fruits that start creamy white, then turn golden orange before maturing to a bright orange blushed with red. Delicious sweet flavor at any stage. Productive 18-24 in. plants. Golden California Wonder are colourful golden bells that are very sweet and tasty. 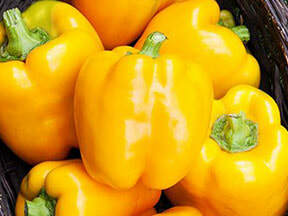 Gold Peppers are superb for fresh eating, great for kitchen or market gardens. The productive plants produce early & are good for the North. Purple peppers are always a favorite, as they are so colorful. Purple Beauty Peppers produce loads of beautiful bells on compact, bushy plants. Crisp texture and mild, sweet flavor makes this one popular with everyone. Keystone Giant Resistant Peppers produce heavy yields. Peppers have thick walls and turn from green to red when mature. Produces well even under adverse weather conditions. A perfect stuffing Pepper. Redskin Peppers are giant bells that look even larger than ever on plants so compact they grow comfortably in containers! Pick them green or let them mature to rich red, when their vitamin content is at its peak. Fiery hot Peppers are easy plants to grow in great variety. There are many different types, each bearing fruits with varying degrees of heat. The plants take up little space, so plant several and decide which you like best. (They're excellent in containers - and attractive!) Ancho or Poblano peppers are mildly hot and often used for stuffing. Jalapenos are several times hotter. Tabasco Peppers are up to 50 times hotter, and Habaneros are 100 times hotter. We've ranked the taste of our hot Peppers from hottest (6 flames) to mildly hot (1 flame). Note: Pepper pungency is about 10 times greater after drying. Also, Peppers grown under stress and/or high heat and humidity will be hotter than Peppers grown under moderate climatic conditions. Anaheim Peppers are green fruits that turn deep red when ripe. Use these pungent peppers fresh or dried. CAUTION: Use rubber gloves or clean hot peppers under running water to avoid skin burn from the pepper juice. The Hungarian Wax Hot is a bright yellow medium hot pepper averages 5.5 in. long and 1.5 in. wide. The fruit is smooth, waxy and tapers. CAUTION: Use rubber gloves or clean hot peppers under running water to avoid skin burn from the pepper juice. Long Red Cayenne Peppers are very hot fruits that are 5 in. long and 0.5 in. thick. Use them fresh or they can easily be dried. CAUTION: Use rubber gloves, or clean hot peppers under running water, to avoid skin burn from the pepper juice. The Tiburon is one of the best Poblano Peppers available anywhere, offering huge yields of extra-large, dark green to red fruit! CAUTION: Use rubber gloves or clean hot peppers under running water to avoid skin burn from the pepper juice. Heat is nothing less than intense as Ghost Chili Peppers are one of the worlds hottest Peppers, if not the hottest. CAUTION: Use rubber gloves or clean hot peppers under running water to avoid skin burn from the pepper juice. Time Bomb Peppers are great for pickling. This cherry Pepper has a great amount of heat. A vigorous plant which produces a heavy yield. CAUTION: Use rubber gloves or clean hot peppers under running water to avoid skin burn from the pepper juice. Habanero Red Peppers have a delicious, pungent, smoky quality unlike any other pepper. Great in sauces and salsas. CAUTION: Use rubber gloves or clean hot peppers under running water to avoid skin burn from the pepper juice. Jalapenos are dark green, medium-hot, thick-walled Peppers 3 in. long and 1 in. wide, with rounded tips. Matures to dark red. CAUTION: Use rubber gloves or clean hot peppers under running water to avoid skin burn from the pepper juice. Even after more than 70 years, Sweet Banana Peppers are still an extremely popular Pepper. Large, pointed fruits measure 7-8 in. long and 1.5 in. across. The yellow peppers ultimately turn brilliant red. A favorite for pickling.